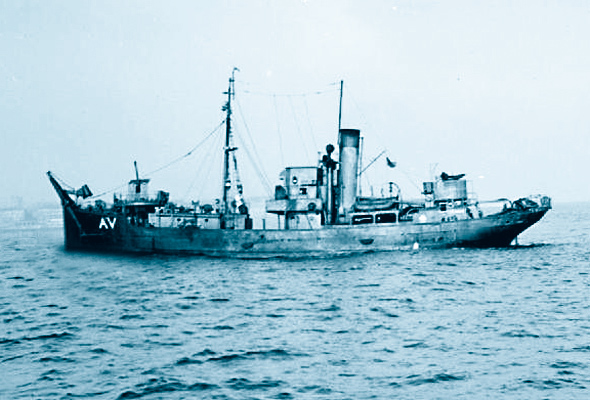 Fleetwood trawlers had many encounters with the enemy during World War II. Submarines, aircraft and mines all added to their hazardous job of bringing home the fish! Within days of the declaration of war with Germany in September 1939 our fishermen were being torpedoed, shot at and taken prisoners. One of the luckiest escapes during those early days involved the 279-ton trawler Alvis. After being held up by a U-boat and ordered to abandon ship the crew took to their lifeboat. But then the Germans said they didn’t think it would be safe – 13 in a small boat – and allowed the Fishermen back on the Alvis! Their story was told by Skipper Albert Thomason when the crew returned to port. It was early afternoon when a shell dropped short of the Alvis and the U-boat appeared. “The commander waved to us from the conning tower signalling us to abandon ship. He kept his gun trained on us,” revealed the skipper. The crew took to the boat and pulled clear of the trawler. Skipper Thomason was told to board the submarine and the commander shook hands with him and said he would have to sink the Alvis. The Germans gave cigarettes to the fishermen and then a party boarded the trawler – along with the trawler’s crew. The Germans smashed the radio and cut away fishing gear but left food and the catch on board. A lieutenant asked for a ship’s lifebuoy as a souvenir and the commander later sent a bottle of gin across to the skipper.